Our great special offers and last minute deals are waiting for you. Click on the Hotel Deco Online Booking Office to take advantage of our unbeatable rates. 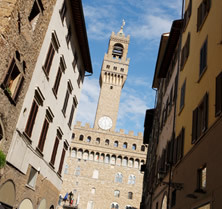 The 2 star Hotel Deco Florence is conveniently located in centre of historical Florence. Located just a few metres from Santa Maria Novella Train Station, we are easy to find and within walking distance of every major tourist attraction there is here - in the timeless and beautiful cultural heart of Italy. Florence is a city that needs no introduction. Florence is a city that needs no introduction. The jewel in the crown of the Tuscan Riviera, Florence is an amazing city that is densely packed with some of the world’s finest architectural and artistic masterpieces that can be found in the many museums dotted throughout the small historical centre and beyond. Indeed one of these museums, the Uffizi Art Gallery, has regularly featured in the list of top 5 visited museums in the world. Whether it’s taking snaps of the exquisite beauty of Michelangelo’s David, wine tasting in the Tuscan countryside or shopping in the bustling streets of Florence, the Hotel Deco can meet your every need. Our great central location makes us incredibly easy to find on foot or by car. If you’re arriving by air, simply take a train or a taxi to the town centre, it’s only 5 miles from the airport. Our address is Via Panzani, 5. It’s the main road leading from Santa Maria Novella Station to the Duomo, the symbol of Florence. From the station you simply come out of the main exit and walk forward. If you get lost, any local person should be able to help you. If driving simply follow signs for the centre (that’s ‘Centro’ in Italian) and Santa Maria Novella. Click here to view the map in full screen.